Early April and a glorious day - bright sunshine and clear skies - and it lasted for the full day, where are the snide quips about Scottish weather now?! ...ok so I'll quit while I'm marginally ahead. Suffice to say that the views were fantastic - miles and miles in every direction. This walk can be done in reverse starting from cairn on track GR130305 and following the path up the S ridge of Beinn Eunaich. Personally, I wouldn't recommend this as the views would be uninspiring until the summit was reached and the climb would have been a monotonous slog through featureless grass and the occasional peat hag. Continuing along the track has the advantage of gaining an additional 150 m for very little effort. Note: Care to be taken at this time of year (April) as the highland cattle in the fields beside the farm had very young calves and didn't look too impressed as we walked amongst them. For those of you who always have to go one step further... yes, these two hills can be grouped with the remaining 2 Cruachan Hills (Ben Cruachan & Stob Diamh), but be prepared for a big day and 2 cars are recommended. The start point for this walk is access road to Castles farm. Parking for 4 cars available on roadside opposite gate. Additional spaces ½ km back along road at junction with A85. Once through the gate follow the track past Castles farm road end and skirt the lower flanks of Beinn Eunaich. Track splits at GR123315. 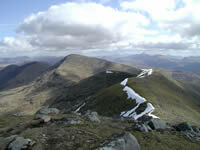 At this point take to the SE ridge of Beinn a' Chochuill. Ground rises steeply but a well worn path is soon picked up leading all the way to the broad summit ridge. A short walk NW along the path over 2 minor tops is all that is required to reach the summit of Beinn a' Chochuill (980m, GR110328). 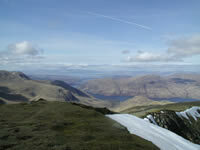 From the summit of Beinn a' Chochuill retrace steps SE then continue NE along path to col at GR128328, 730 m). After a short steep pull the summit cairn of Beinn Eunaich is reached (988m, GR136328). The route home is straightforward. Follow the well worn path off the S ridge. After a gentle start the ground steepens sharply before rejoining the track.GR130305.